At David Crystal’s signature Q&A session. Baby will end sentences with prepositions one day but will probably say “orientate” not “orient”. It’s hard to say which factor absents you from participating fully in a conference more — going with a one-month old baby or giving a talk on the last night and having to prepare it for the three days beforehand. IATEFL 2015 was very different for me than 2014. Last year I went to loads of sessions. This year I went to three. Ken Wilson’s because I can’t resist his effortless delivery style, David Crystal’s because I’ve not seen him before and it was a Q&A about finickity language points and, in an attempt to break away from the big names, a disappointing talk I’d been recommended. It was disappointing because it had masses of content but was read at high speed from a 12 page handout with indecipherable stats and research. The only one of those talks I brought baby to was David Crystal’s as it was in the 500 seat auditorium and I knew I could dive out if things went badly. Surprisingly, people didn’t avoid sitting near me and the potential disturbance and, in fact, more noise was made by late arrivers. 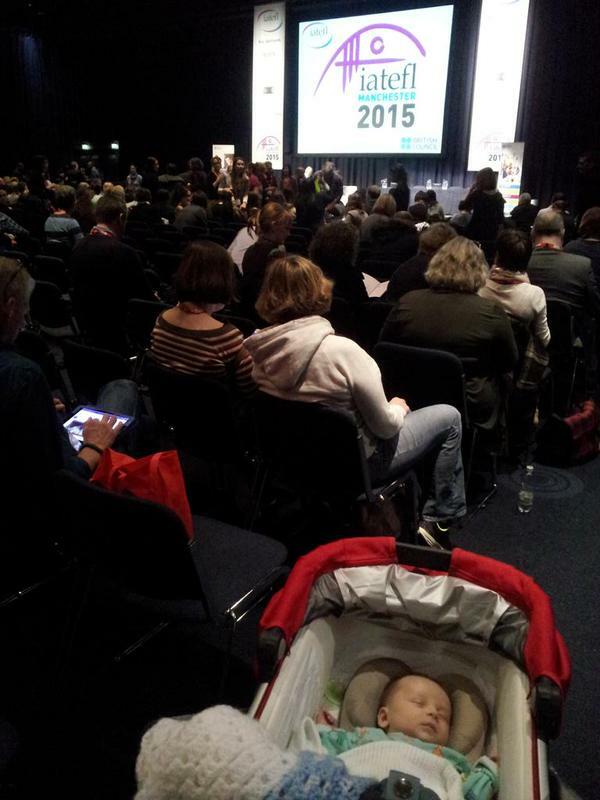 Apart from at the point where the audience was asked for questions and baby answered by loudly filling his nappy. I toured the exhibition hall a few times with the pram and “The IATEFL baby” but I didn’t do more than catch up with people I already knew and people who recognised me from having written about this the other week. That support, mostly, but not exclusively, from parents was unexpected but really nice and certainly helped fill out our 40 seater room. And I was surprised to hear the Hadfields say they had brought their children to conferences for years back in the day. I think I only saw one other small child there but there may have been others I missed. And a handful of heavily pregnant women attending or working which was a feat I’d never have been able to manage in that phase of pregnancy. Would a crèche have been helpful? Maybe. But for an older child more than a tiny baby. Is that ever likely to happen? Probably not. There is the feeling that parents wouldn’t want to leave their children with strangers who didn’t speak their language and that it would only benefit UK based parents as those coming from abroad would arrange childcare with grandparents or partners back home. I don’t get the logic of “if you can’t help everyone, help no-one” but it’s, of course, possible a crèche would simply remain empty for four days. I couldn’t have done it without the help of Granny and Nana but that was an expensive option as they had to stay in the same hotel as us and won’t be replicable another year. But I won’t be breastfeeding by then so maybe could leave him. Even with that, the day of my own presentation meant leaving him hungryish a couple of times and crying himself to sleep for which I felt very guilty. A crèche would have meant he was at least in the conference centre and nearer by. There were no lactation incidents, I fed him in public no problem and changed his nappy as and when but the wardrobe element was less of a success. New jeans — still maternity — so as to be slightly smarter than my too loose ones rubbed my C-section scar horribly where the seam was and I finished presentation day physically shattered. I’m not sure I’d recommend being on your feet all day one month after that op but I can at least say it is possible if you’re determined. No reason why anyone should be directing their determination in that way, though. Choice is the important thing. And the right jeans. The only blog I read the moment it comes into my inbox. Glad it went well for you and well done…I’m not sure I could have done that only a month after giving birth! Wow – that’s high praise! And thanks … I think with the grandmothers was the key to the success of the venture though and he’s been much tougher to look after since they are not here! And the wardrobe malfunction I spotted on Day 1? 😉 … I think the number of children at a conference depends very much on dates as well. Fiona Mauchline has taken her boys to TESOL Spain (when they were younger and friends helped out). I’ve taken my daughter a couple of times (and she helped out!). It’s a good point though. Maybe if there was a creche, more people would be attracted to come. I’ve had to pull out of conferences a couple of times when childcare let me down 😦 It’ll be interesting to see what other people think. AND more importantly I forgot that I came to your talk on Free and Fair ELT which means I was at 4 not 3! This entry was posted on April 16, 2015 by Nicola in ELT and tagged conferences, EFL, ELT, ESL, IATEFL 2015.